In 2012, I did a short write-up on Singapore Green Corridor when it was opened to public (Build Mountain Bike Trail along Singapore Green Corridor). 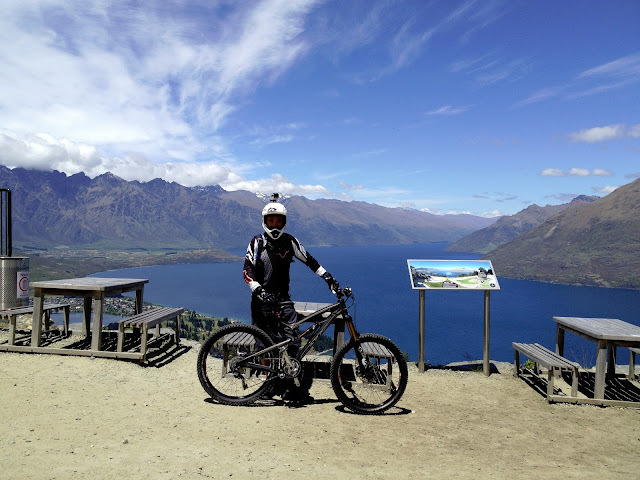 Two years later, I revisited the trails and explore the safest path to BT Mountain Bike Trails from East Coast Park Connector. The safest way to ride from East Coast area to Bukit Timah MTB park is via East Coast Park (ECP) PCN, Marina Bay and Singapore Green Corridor (Ex-KTM railway line). Along the way, you can make a few stops for refreshment, such as Satay By the Bay; Festival Market at Shenton Way; Alexandra Village Food Centre; and Binjai Park Coffeeshop at Bukit Timah. The distance starting from East Coast Park Food Centre to Marina Bay Sand (MBS) is about 13.4km. If you are on recreation ride, you may want to stop by at Satay By the Bay (12.5km) for refreshment. During this ride, we decided to stopover at Festival Market and drop by Satay by the Bay on the way back home. We stopover at Festival Market along Shenton Way for watermelon juice. Most of the stalls were closed on Sunday, as CBD businesses mainly catered for office workers. We craved for Chendo, but the stalls were closed and we settled for watermelon juice. The total Green Corridor distance starting from Tanjong Pagar Railway Station to Bukit Timah Nature Reserve is about 15km to 16km. You will ride pass under few bridges, of which two were painted with striking street arts. The above photo illustrated one of the best. We decided to stopover at Alexandra Village Food Centre for Lunch. Once you pass Treknology Building (Trek dealer), look out for exit point at Alexandra Industrial Park (Block 1010). Refer to above photo, exit the Green Corridor Trails and navigate your way to Alexandra Village Food Centre. Estimate about 200m ride. The infamous Lau Phua Chay roasted pork and duck rice at Alexandra Village Food Centre, awesomely yummy. The essence of these dishes was the roasted pork sauce. Ask for more sauce! After a good meal, we were recharged and continued our ride towards Bukit Timah MTB trails. When you see Bukit Timah Railway Station, you are very near to the entrance of Bukit Timah MTB Trails. After about 33km of ride from East Coast Park Food Centre, we finally arrived at the entrance of Bukit Timah MTB Trails. I was ready to shred the trails. 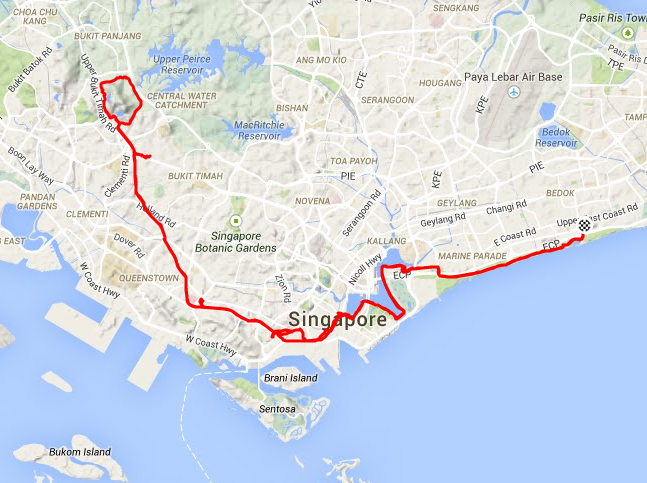 After BT ride, we rode another 36km along Green Corridor, MBS and ECP home. The total riding distance is about 69km in total. On the way back, we stopped at Satay By the Bay at Garden By the Bay to have a quick fixed of satay craving. They made the best satay in Singapore. Awesome Chris! Didn't know MTB was so prevalent in Singapore or I would have brought my bike back in 2002! My wife and I stayed there for a week before going to Bali. It was awesome man! We did hit up the indoor snowboarding venue though...the workers were super nice! Anyway, glad I found your blog on the XX1 rear der adjusting! Cheers! Can arrange a meetup so any enthusiasts can follow you as you lead us through the route. Thumbs up!